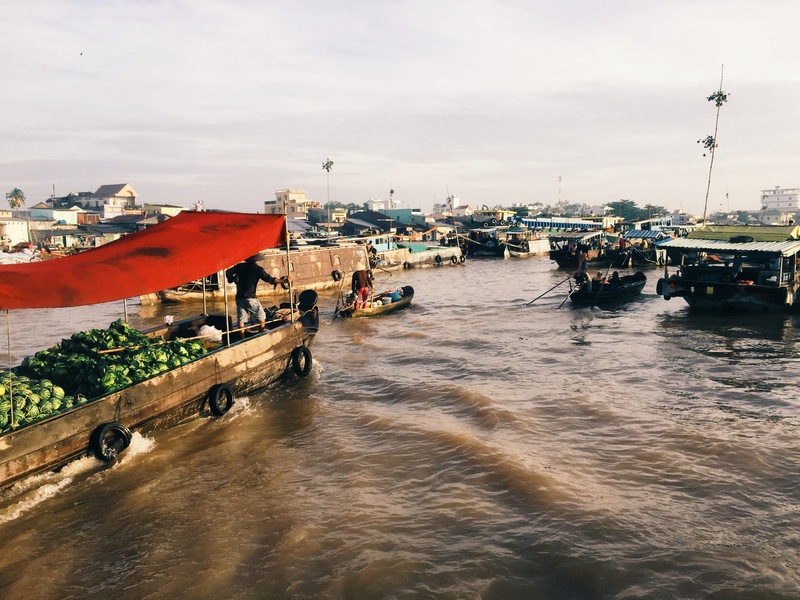 Visiting floating markets in Mekong Delta is one of the most exciting and eye opening activities to do in Vietnam. Although there are a few to visit, Cai Rang floating market is the largest and most accessible from Saigon. 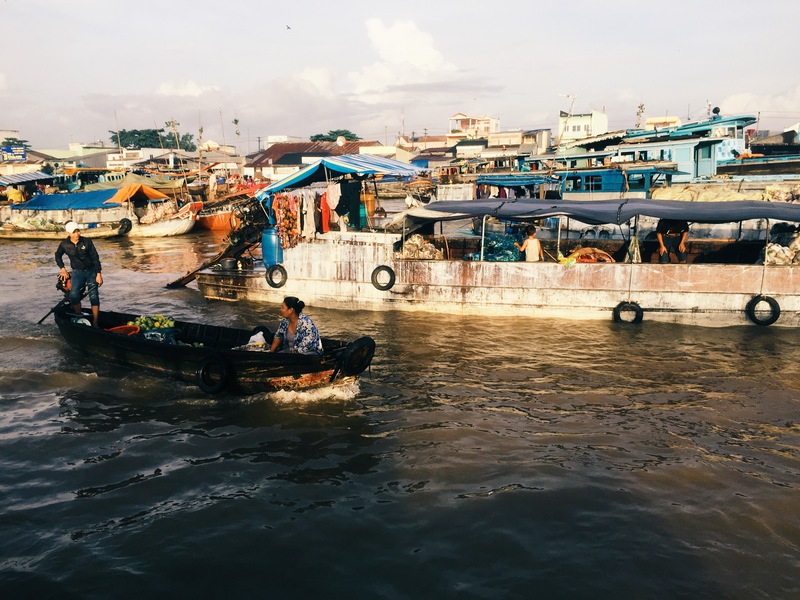 I have lived in Vietnam for a while, yet this is the first time I have ventured down to the Mekong Delta to embrace the hustle and bustle of the floating markets. Cai Rang floating market is the biggest floating market in Can Tho, approximately 200kms from Saigon and one of the branches of Mekong Delta. How to get to Cai Rang floating market? 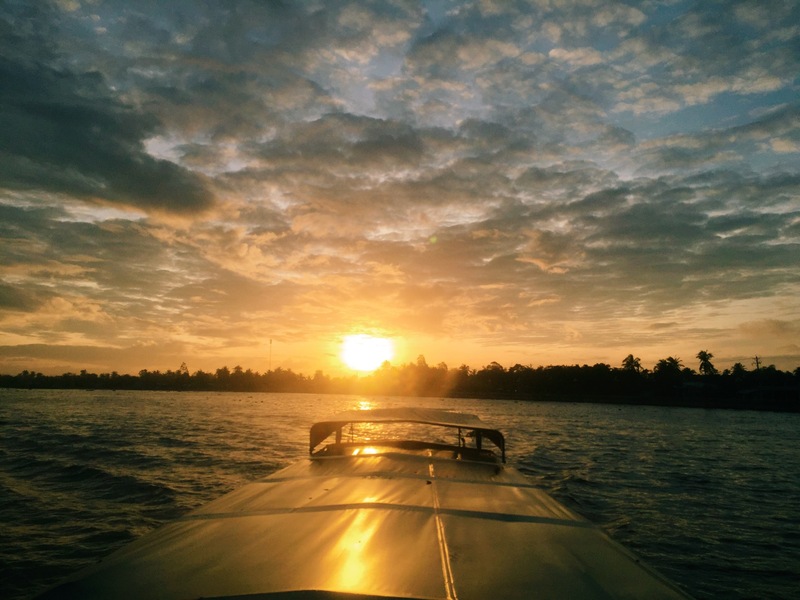 The most popular method of transport to get to Can Tho is by buses, and the whole trip takes about 4 hours from Saigon, although if you are in a small group, you can also book a private car. If you are adventurous and want to have a good old fashioned road trip, you can rent bikes from Saigon and make the journey down yourselves, however, the roads are quite dangerous and I wouldn’t recommend it if you are first time visitors. In terms of buses, tickets are available at Phuong Trang bus office at 272 De Tham, District 1 or you can book online. A one way ticket costs about $5.5 and departs every 4-5 hours per day. Unfortunately, there is no flight to Can Tho. The view from the boat of the river banks on the way to Cai Rang floating market. 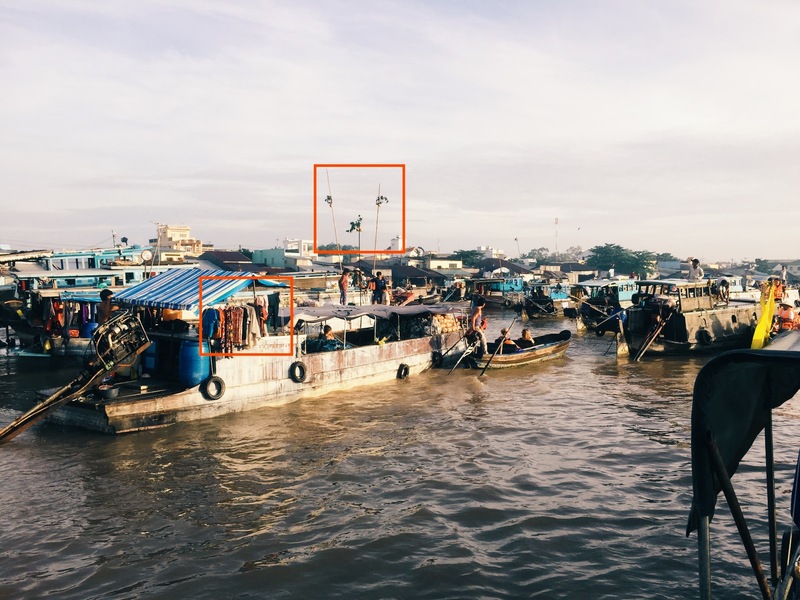 From Ninh Kieu station, there are 2 types of boats that you can book to visit the market. It is possible to book these tickets in advance but personally I don’t think it is necessary as you can buy tickets at the station. A big boat has about 15 seats and the roof which is convenient in rains. The smaller one is a wooden speed boat that can fit 2 to 4 passengers but does not have a roof. If you want to go with the smaller one, the ticket is around 200,000 VND ($10). Coming here in raining season, I chose to pay for a big boat which is 360,000 VND even though I traveled alone. The busiest and best time to visit is the week before lunar New Year which falls on late January and early February. That is great opportunity to observe the dynamic trading vibes when locals gather and shop for their new year goods. View to Can Tho from Muong Thanh hotel rooftop cafe. Cai Rang is only 6km away from the city centre and around 30 minutes by boat from Ninh Kieu station. Hence, you can easily book a hotel around city center and catch a taxi to the station. I decided to stay in Muong Thanh hotel, which is one of the tallest building in this area and about a 10 minute ride to the station. 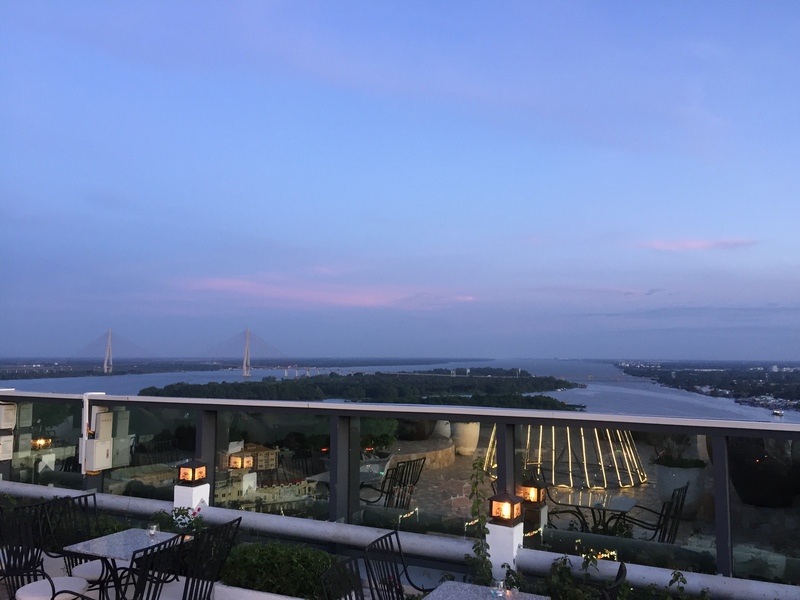 Although this hotel is a little bit more expensive than others, you will appreciate the quietness and the view from its rooftop bar. If you are travelling on a budget, you can stay at many other good hotels or guest houses in the city for as little as $10 per night. 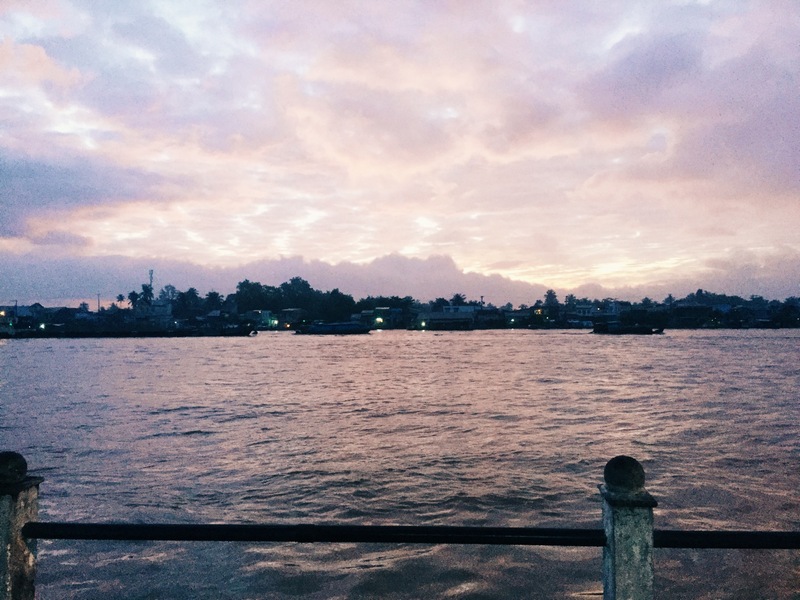 The view from Ninh Kieu station where you can get the boat to Cai Rang floating market. Cai Rang market opens as early as 5am every day, although the best time to visit is around 6am when the market really starts to liven up and you will be able to appreciate the picturesque beauty of the floating market as the sun rises. To truly get the full experience of Cai Rang floating market you should leave Saigon around 4pm the day before and spend the night exploring the town before visiting the market the following morning. However, if it is your first time in Vietnam, travelling alone might not be a wise choice. To actually experience a memorable Cai Rang floating market trip, having a local guide does not only help you with your trip arrangements, but also connecting you to the real authentic experiences. I arrived at Ninh Kieu station around the 5.30am and immediately loved the early morning scene. To my surprise, there were not many boats coming in and out the station this time of the day as it took me less than 2 minutes to hop on my boat. 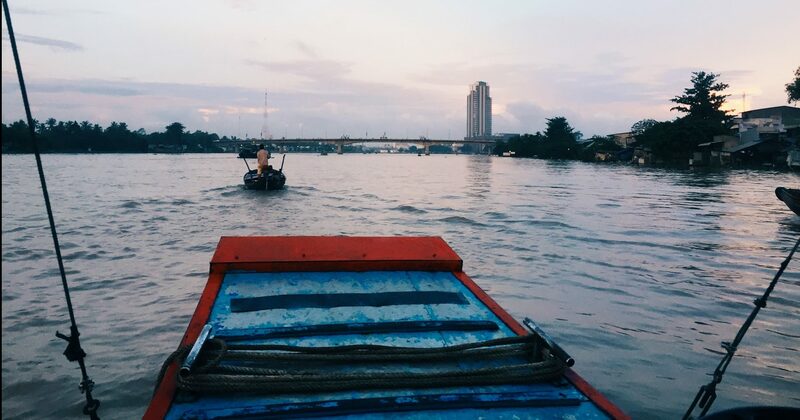 As we were sailing across the river, I had chance to understand more of the history of Cai Rang floating market through conversation with local driver. It takes approximately 30 minutes to get to Cai Rang floating market from Ninh Kieu Station. As far as we know, the market was formed by the Khmer people (originating in Cambodian) hundreds years ago. Nowadays, it remains to be one of the largest trading hubs in the region. One of the things that I found most amusing were the floating petrol stations along the river banks. These are on-water convenient shops where boats can stop over to fill up on gas and stocks. I wonder how long it will take before 7-Eleven branch out and start setting up floating shops over here! 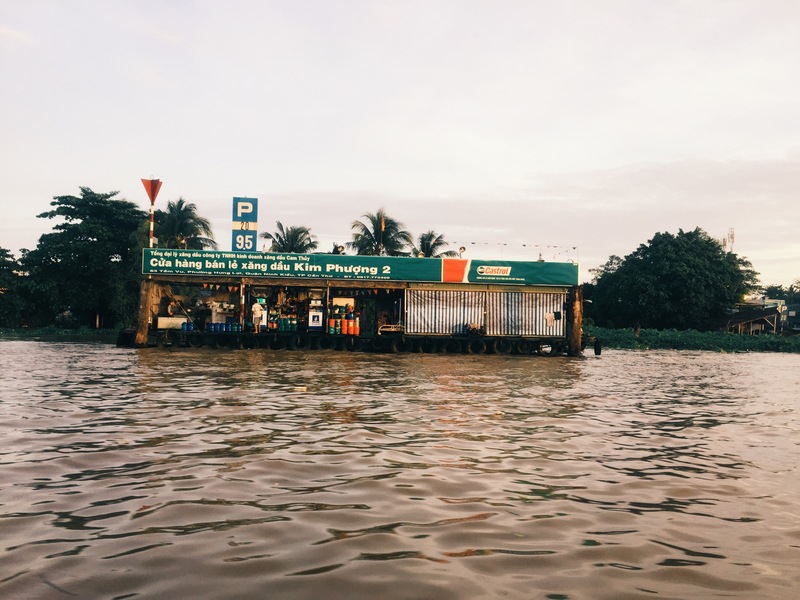 Whenever they want to replenish their stocks, boats stop at floating petrol station that sell everything from petrol to foods such as instant noodle. After roughly 30 minutes, I finally arrived at the market, which from far away, looked like an ordinary group of fishing boats floating together. However, when you get closer, you can get a feel for the busy trading activities that occur over here, just like other Vietnamese markets. The locals here sell not only fruits but also many products such as food, veggies and even lottery tickets. Cai Rang is the largest fruits trading hub and the last one of the nine branches of Mekong Delta. On many of the boats, clothes and blankets are hung out of the side of the boat, in a similar way to the way they hang their products. Bemused, I enquired about these clothes to my boat driver, who informed me that these garments were not for sale. He further explained that boats are more like a house to the locals and almost all their daily activities occur on the boats including drying their clothes. If you are confused what certain boats are offering, you can look out for the tall bamboo stick with a sample product attached to it. For instance, if a boat sells oranges, the owner will hang a couple of oranges on a large vertical stick to let the customers know what he is offering. Not all of the items hung on the boat are for sale, clothes are one example of this. Sample products are usually hung on a tall bamboo stick to show which items are for sale. 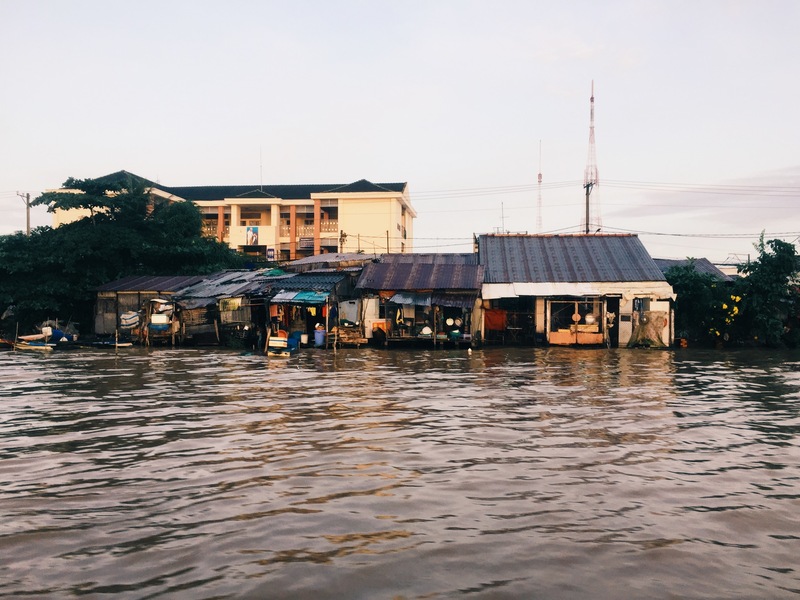 As I delved deeper into the inner circle of the market, I really began to appreciate the hustle and bustle of the floating market, from running boat engines, people haggling to the water sloshing against the boats. It feels just like you are in a typical flea market, except that you are floating. As we explored more of the market, I decided to treat myself a small bowl of traditional Bun Rieu (Seafood noodle) and a cup of hot soya milk. It is truly a unique experience to embrace life on the river with a hot soup, floating around blissfully. 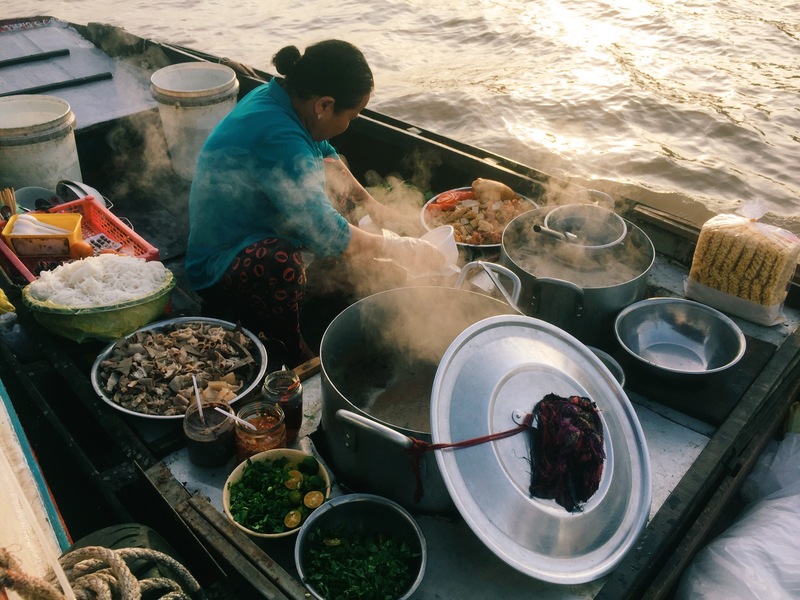 One of the trademarks of floating markets is vendors who turn their boat to a small kitchen and make their living selling foods to other boats. I traveled to the Cai Rang floating market in off peak season, so i managed to see most of the main attractions in a relatively short amount of time. In total, the trip took me an hour and a half, but if you have more time, there are boats designated to take you to fruit gardens along the river banks where you can try the local specialties. As I slowly drifted away from the market, I glanced back at the local kids having fun on the boats and wondered what it would be like to grow up in this environment. For many years these young people may not have known any other life, other than life on a boat. Because of this it may prove difficult to break the mould and move to another lifestyle in their years ahead. Sunrise on the Cai Rang floating market. I really enjoyed my trip to the Cai Rang floating market, which allowed me to embrace local culture by giving me an insight into how local people in this area live their lives. Although Can Tho city is not a very touristic place, it offers an unforgettable experience and great opportunities to see the real Vietnamese local life. If you are travelling in this area i would recommend trying to fit this trip into your itinerary, but keep in mind all the other fantastic activities you can experience whilst travelling through the central and northern regions of this country. Cai Rang floating market is definitely a must-visit destination but getting there and being able to immerse into an authentic floating market experience could be a real challenge for any travellers. I highly recommend Inspitrip, a platform connecting travellers to local guides who can take care of all travellers’ concerns; and offer them only the most local experience they can.